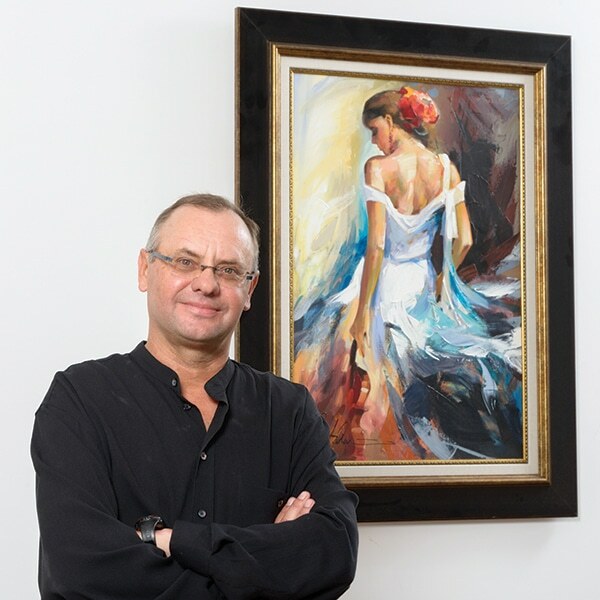 Artist Anatoly Metlan is inspired by the world, so in turn, he inspires the world with art that celebrates its beauty and cultures. Born in 1964 in Yalta, a Ukrainian city on the coast of the Black Sea, Metlan was encouraged from a young age to be creative. Both of his parents experimented with art, leading Metlan to eventually study at a local arts high school. He later enrolled at the Krivoi Rog University in Ukraine. While in college, Metlan began exhibiting his works. Metlan’s talents quickly garnered attention, so much so that in 1989 the National Artists Guild of Ukraine accepted him as one of its members. In December 1991 the Soviet Union collapsed, causing Meltan and his family to immigrate to Israel. He still resides in Israel to this day, and exhibits his art around the world. Metlan is influenced by his travels and cultural experiences. He transports viewers to the locations and concerts he attends by instilling the canvas with the mood and excitement of his adventures. 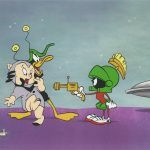 If you’re looking to learn more about this citizen of the world, here are some insights into what inspires his romantic and energetic art. The Mediterranean is known for its lovely climate of mild winters and hot summers. The expansive variety of terrain, from tall mountains to sandy beaches, provides splendid views wherever you go. It’s Metlan’s travels through this magical region that serve as the basis for his landscapes and cityscapes. Metlan infuses his works with the tranquil atmosphere of the Mediterranean, portraying it in all its glory. 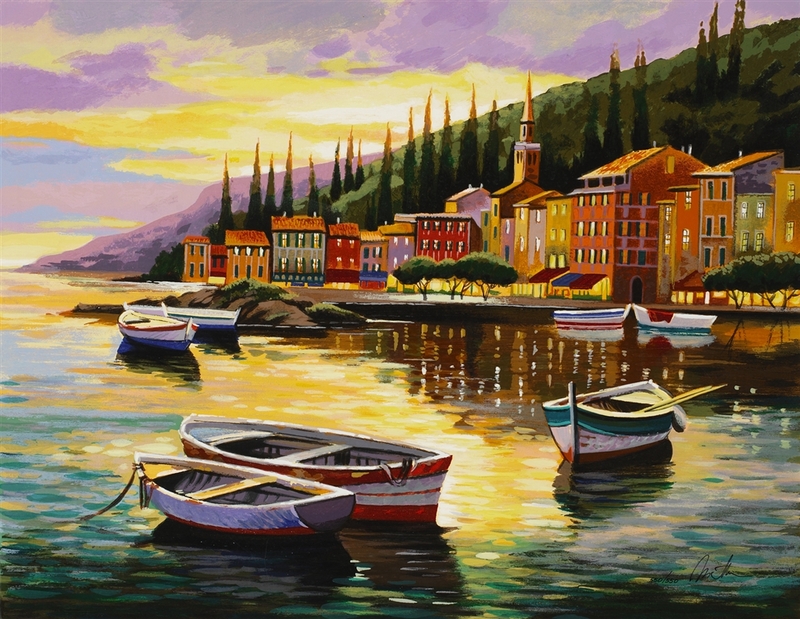 He portrays colorful boats sailing along blue waters as morning sunlight pours from the sky, or welcoming homes lining narrow streets of coastal cities. Metlan’s travels through southern Europe exposed him to many different cultures, but none have inspired him quite like Spain and its flamenco dancers. 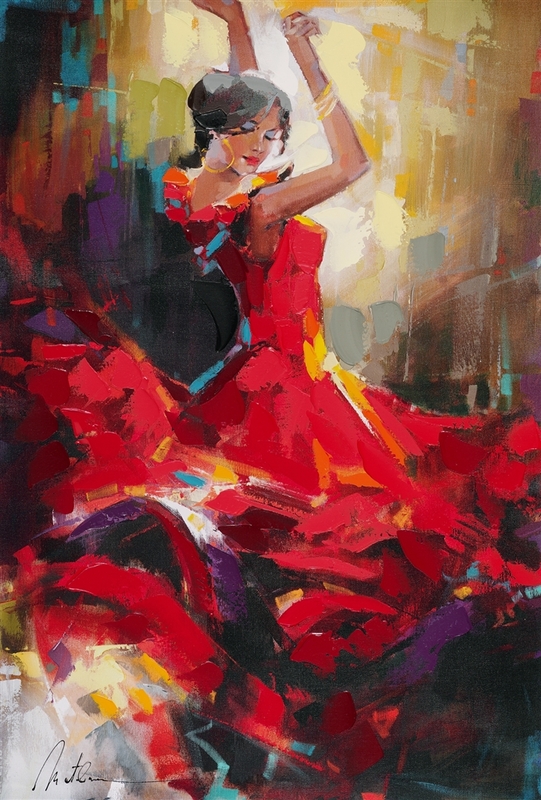 Much like Metlan’s paintings, flamenco dancing is influenced by multiple world cultures, including Latin American and Cuban. 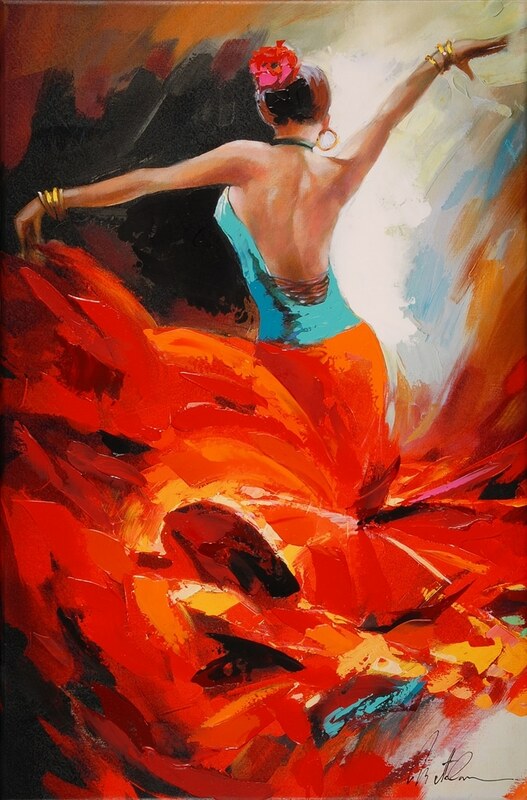 As the female performer dances, her fiery skirt flows with her movements as if it had a life of its own. In addition to their ruffled skirts, the dancers wear festive bracelets and brandish handheld fans. Metlan was so entranced by the flamenco performances he saw that he developed a new painting style in order to properly convey the dramatic and expressive movements of the dancers. He traded his paintbrush for a palette knife, using large strokes to create patches of textured paint that form traditional flamenco outfits on his canvases. “It has become an impulse of inspiration for a new period, a new phase of my art,” Metlan says. Metlan’s new phase in his artistic career led to his latest series of musically-inspired works. He portrays elegantly-dressed women wielding violins, saxophones, and other instruments. Each woman is delicately posed, whether they’ve just finished a performance or are about to step on stage to begin. In addition to a love of art, Metlan’s mother was a violin player. As such, Metlan expresses the nostalgia of his childhood and love for his mother through the portrayal of musical women. Despite not being a musician himself, music is important to Metlan’s creative process. 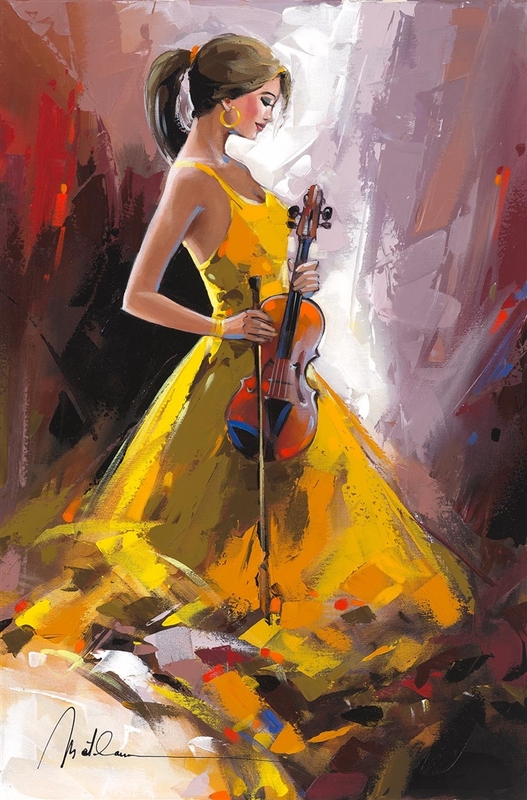 The artist enjoys listening to music while working, most notably that of Russian musicians from the romantic period. Examples include composer Pyotr Ilyich Tchaikovsky and pianist Sergei Rachmaninov. 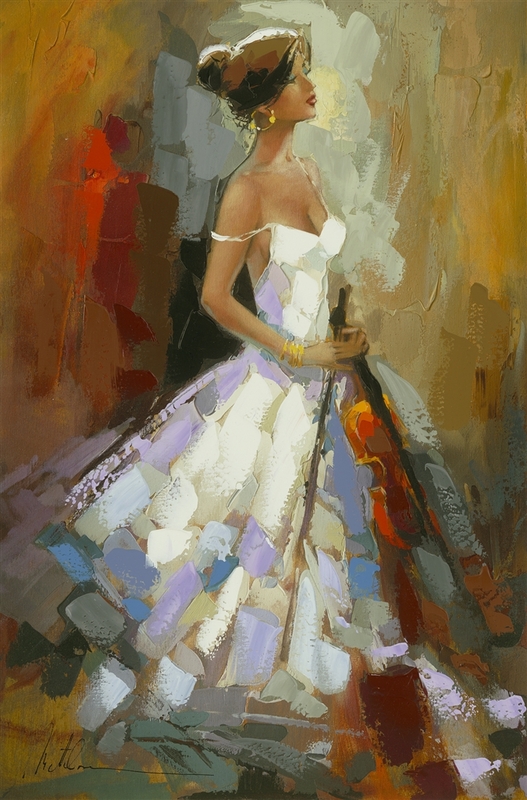 To collect the artwork of Anatoly Metlan, contact our gallery consultants at (800) 521-9654 ext. 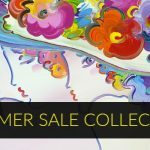 4 during business hours or sales@parkwestgallery.com after hours. I bought one of his violinist paintings this year. Very different from the other art I saw. The are was very “vanilla” compared to his.